It’s not news that society has been living an increasingly sedentary lifestyle, correlating with poor health at the same time. What is new, however, is that the hour or two you put into exercising to counteract an entire day’s worth of sitting is not going to cut it. Research shows that regardless of how much you work out, if you’re sitting more than you’re standing, you have a higher risk of colon cancer, endometrial cancer, lung cancer, heart disease and more. Your body is designed to move and changing your seated work style to a standing, dynamic one can make huge changes in overall health, burn about 500-1,000 excess calories per day and even improve work performance. Easy Access & Adjustment – With a manual height adjustable desk, the TR1200-DT5 can adequately adapt to users from anywhere between 4’10” and 6’8” in height. In order to keep comfort a priority, the armrests are padded and the desk is a separate piece from the treadmill, guaranteeing that no movement or disturbance from the treadmill carries onto the desktop. And we’re sure that when you picture a treadmill, you see an assortment of complicated buttons and blinking screens that show you how many steps you’ve taken, walking time, calories burned, distance, speed and etc. On the TR1200-DT5, this console and digital LED display is simplified into a small strip at the bottom of your desktop, giving you room to complete your work while staying 100% accessible. Smart Safety Features – The TR1200-DT5 treadmill workstation comes with a couple of intelligent Lifespan trademarked technologies, Intelli-Guard and Intelli-Step, which promote the safety of the user and those surrounding them. First, the Intelli-Guard mechanization protects you from potential injuries by suspending the belt when you step off. The treadmill will automatically pause on its own once it senses that your feet are no longer striking the belt for 20 seconds. The Intelli-Step is the technology that keeps track of the number of steps you take. It simply senses the impact of your feet, counts your strides and displays the results on your console. Media Integration – Best of all, with Bluetooth capabilities, this walking desk can wirelessly transfer all of your activity data and recordings to your Windows or Mac computer in an instant. Simply download Lifespan’s free computer app, and you can start tracking your daily progress. 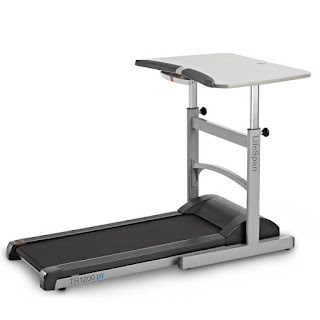 The TR1200-DT5 comes in with a choice of both manual and electric height adjustment versions, so browse or call Concord Health Supply for further information regarding our treadmill desks or other health care products.